You’ll notice a big difference between a raw steak, as it’s served in carpaccio, and a perfectly grilled rare steak, which is often a better match for mashed potatoes. 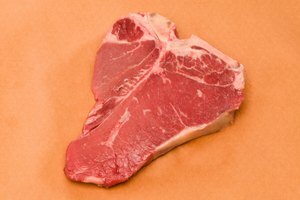 Raw steaks look and taste different than rare steaks. They each even have their own distinct texture and are served at different temperatures. With a little background knowledge, you'll figure out which steak is a better suitor for your palate. Fresh raw beef should be bright red and pink on the outside, as well as the inside. It might even be a little greyish depending on oxygen exposure, which is fine and perfectly normal as long as it doesn’t smell rotten. Rare steak will be browned on the outside. This color forms as amino acids and sugars in the steak react with the heat, a process known as the Maillard reaction. When you slice into the rare steak, it should be bright red in the center. If it’s more of a pink or brownish color in the middle, it was likely overcooked. When you press on a raw steak, it will feel soft and mushy. That spongy texture may not be desirable for some. After cooking it, the browning that occurs on the outside will add some roughness, making it a bit tougher on the outside. However, the inside of the rare steak will still have somewhat of a mushy texture, depending on how long it cooks and how long it rests off the heat source. 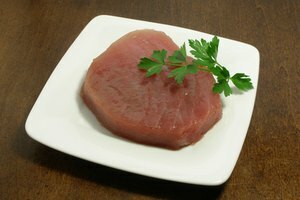 Raw steak has a bloody taste, but is generally served with some seasonings, capers, lemon or mustard, all mixed together as a tartare-type dish. A rare steak cooked on a grill will have a charred flavor, or a buttery flavor, if it was seared in a hot skillet. If you enjoy the raw texture, but still want that charred outside flavor, order your steak Pittsburgh rare. This very rare steak is cooked on a very hot surface, often coated in oil or butter, to create a blackened outer crust. The outside cooks so fast, the inside doesn't get a chance to heat up much, leaving it with a raw and bloody taste. Uncooked steak should ideally come right out of the refrigerator for food safety purposes -- if it is left sitting out, harmful bacteria can grow. Therefore, it will probably be a refrigerated temp upon serving, at 40 degrees Fahrenheit or below. Since a rare steak gets exposed to a heat source for a few minutes, it will be slightly warm. 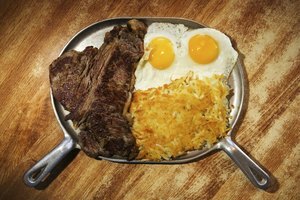 Usually a rare steak reaches a minimum internal temperature of around 125 degrees F, give or take a few degrees, according to the Food Network. 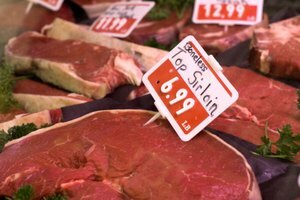 Raw and rare steaks have a risk of causing food-borne illness. 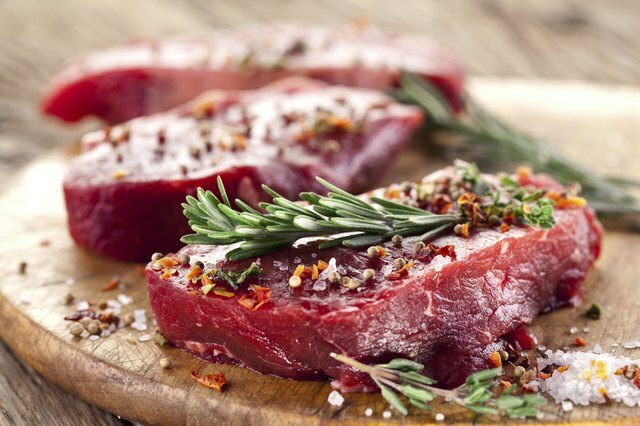 If you plan on making a dish with raw steak, meat needs to be refrigerated until serving. It should not go into the temperature danger zone, greater than 40 degrees F. The U.S. Department of Agriculture recommends cooking steaks and chops -- beef, pork, lamb or veal -- up to a minimum internal temperature of 145 degrees F. If you become sick from a food-borne illness, symptoms can kick in a few minutes after eating the offending food or several days later. It may feel as if you have the flu accompanied by nausea, diarrhea and vomiting. Healthy adults should recover fine, but children, pregnant women and older adults can get dangerously ill. Those who fall into these demographic groups should avoid raw or rare steaks. 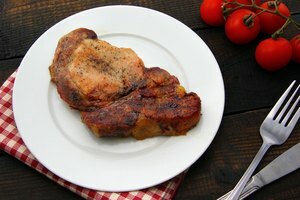 Home Food Safety: Can Rare Meat Be Safe? How Long Should I Smoke a Steak?